For more details and to sign-up, click here. To win a chance to participate in a 3-hour printmaking workshop for free during ArtHouse, print this invitation card and drop it off at the ICA on or before April 15, 2011. For ArtHouse information and programming updates, please go to http://www.sjica.org. We are very excited to be presenting this inaugural event and hope to see you in there. Please feel free to invite your friends and family. Cheers and stay tuned for more ArtHouse news in the coming weeks. so says Robyn Blummer of the St. Petersburg Times who writes about the 450 + reasons NARM is the ultimate cultural passport. NARM: North American Reciprocal Membership Program. Read about it here and GET IT as an ICA “Friend” member and above. GOT Steve Martin to the San Jose ICA! Well folks, we did it! Together, through a stealth and somewhat misguided national mobilization effort to Get Steve Martin the the San Jose ICA’s 30th Annual Art Exhibition and Auction we GOT the Steve to the ICA! Read the original invitation letter here to see how it all started. Below is our Thank You letter to Steve. Visit the ICA website to get all the details. You are even more clever than you look. Hard to fathom. Today we received your RSVP to our upcoming 30th Annual Art Exhibition and Auction in October. Thank you, Steve <fist bump>. And of course you responded in your expected, unexpected way. Well who are the weirdos now? Ok, we’re still weird but that’s beside the point. We are now excitedly scheming about how we’re going to present your generous performance piece to our members, friends, supporters and guests at our anniversary event celebration. And rest assured Steve, it will be done in the spirit of your generous gift, talent and truly genuine nature. Again Steve, thank you so very much. WE knew you would support the ICA and our 30-year old mission to serve up the best contemporary art in the hood. You get it, Steve. Very, very cool. Get Steve Martin to the San Jose ICA Auction! We recently sent this invitation letter to Steve Martin (see below). And guess what? It worked! Read our Thank You letter to Steve. 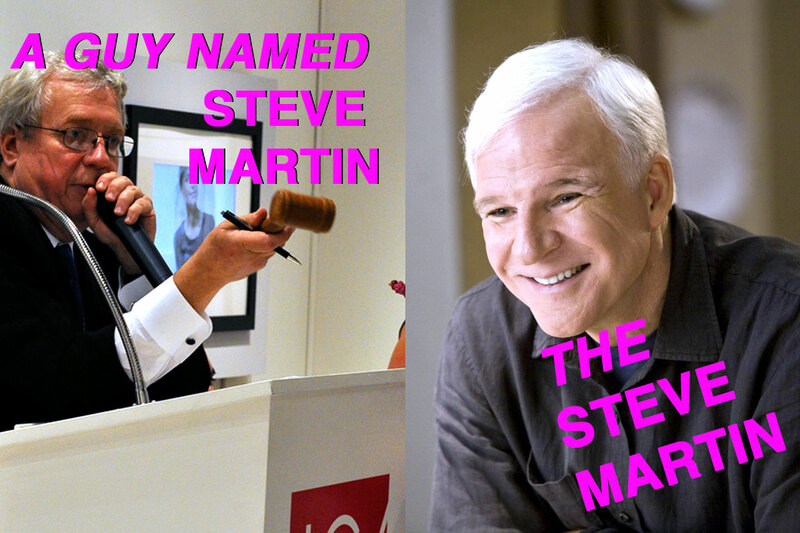 And while you’re at it, become a fan of “Get Steve Martin to the ICA” on Facebook! The San Jose Institute of Contemporary Art (ICA) is a non-profit contemporary art gallery that presents work by established and emerging regional artists and provides educational programming to members, donors and the community. We are inviting you to join the ICA this year as we celebrate our 30th anniversary. Why you? Why us? We’ll explain. The ICA has presented its Annual Fall Art Exhibition and Auction – our major fundraiser of the year –since we opened our doors 30 years ago. More than 175 works donated by established artists including Manuel Neri and Frank Lobell to “anonymous” artists are on view and for sale during the exhibition and auction. This is a big deal for us and for the artistic and cultural community that we serve . This year the exhibition opens on October 1st with a silent auction. The live auction – the “big event” – is on Saturday, October 23rd. For the past 10 years the auction has been led by a good friend of the ICA and professional auctioneer named, you guessed it, Steve Martin. And during these past ten years we have often wondered and dreamed about how cool it would be if the other Steve Martin (that’s you) attended our auction. We also know, as many do, that you are an avid art collector/enthusiast; that you started buying art when you were in college; and that you’ve long been a champion of art collecting and art appreciation. High five! Steve, this year we want to blow the roof off the joint. So we figured, let’s just go for it. Let’s ask the other Steve Martin to join in the celebration too! What have we got to lose? A smidgen of pride? The respect of our friends and community? Our jobs? Pish! We don’t care! We’re doing it. We’re inviting the other Steve Martin to our anniversary celebration. So, all kidding and lame attempts at humor aside, we really are serious. We cordially invite you to join us and our friends at our big auction celebration this year. Check us out on our website (http://www.sjica.org). If you go to the “Exhibition Archive” Page you can read all about our past auctions, view pics and see the amazing works that artists have donated over the years. You can call or email us if you want to explore this “amazing offer” further. Thank you the Steve Martin for your time and consideration. We look forward to a-snowball’s-chance-in-hell of speaking with you. What a blogpost!! Very interesting… Looking for more posts like this!! Keep you the goodwork! Anyway thank you for this info.